Frank Schröder, born in 1972, is a graduate civil engineer. He began his professional career as a construction manager. A short time later, he shifted the focus of his professional activities to the sale of software products. For several years he was employed at HSD GmbH, where he sold software for facility management. He was then employed at DIS AG - in the area of sales IT projects. 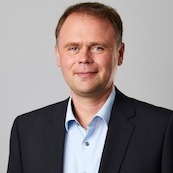 Since 2015 he is responsible for the sales of the energy management software IngSoft InterWatt at IngSoft GmbH in Northern Germany and non-German speaking countries.